Admission Price: Registration for this event has now closed. On 18 October, 1929, the Judicial Committee of the Privy Council broke with a long of authority holding that women were ineligible for public office and ruled that a woman could be appointed to Canada's Senate. Striking the most powerful and enduring metaphor in Canadian constitutional jurisprudence, Lord Sankey, the reform-minded Lord Chancellor, proclaimed that the constitution is "a living tree capable of growth and expansion within its natural limits," a document that is in "a continuous process of evolution." This lecture will consider the Persons case in its political and social context and explore the views of the litigants who brought the case, the lawyers who argued it, and the judges who decided it. 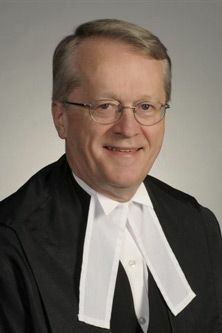 The Honourable Robert J. Sharpe has been a judge of the Ontario Court of Appeal for Ontario since 1999. He holds an LL.B. from the University of Toronto and a D.Phil. from Oxford University. He was called to the Bar of Ontario in 1974 and practised civil litigation with MacKinnon, McTaggart (later McTaggart Potts). He taught at the Faculty of Law, University of Toronto and served as Executive Legal Officer at the Supreme Court of Canada under then Chief Justice Brian Dickson. He went on to serve as Dean of the Faculty of Law at the University of Toronto before being appointed to the Ontario Court of Justice (General Division), now called the Superior Court of Justice, and then to the Court of Appeal. He has written many books and scholarly articles and has reported judgements as a trial and appellate judge in a wide variety of areas. He has also appeared as counsel before courts at all levels, including the Supreme Court of Canada. Justice Sharpe is a frequent lecturer at continuing education programs for lawyers and judges. He also lectures at many Canadian and international universities. This event is the second lecture in The City Law School Spring Lecture Series.